Photo Manager: preview organize scan edit and print your digital photos. Find images on your computer and remove duplicates. 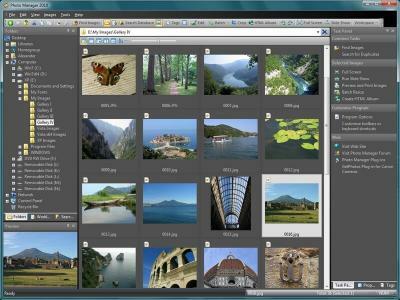 Assign keywords ratings and captions to your photos and then pick the required photo from the database. Exposure Color Balance Levels White Balance Red Eye Correction and other adjustments. Batch operations - Resize Convert Rename Rotate. Create Web Album Crop.Photo Manager key features:- Browse folders and preview images- Print photos- Edit images (including Exposure Levels White balance Auto Color and other adjustments)- Assign keywords ratings and categories to Images- Search in database- Search for images on local discs and network Drives- Search for duplicates- Manage photos- Support to EXIF properties RAW format and plug-ins. New features: Custom Sort Export Tags Import Tags other features.